Update August 2015: I still love the C720. I’ve replaced the SSD with a larger one (not really necessary, but nice) and installed Ubuntu 14.04 LTS on it (from here). Ubuntu absolutely flies on it and the distro includes all of the drivers so it installed and ran without a hitch. The portability and price of this machine simply can’t be beat and it’s fast too! After years of disparaging them, curiosity (and ever declining prices) got the better of me and I bought a Chromebook: an Acer C720 for $130. I bought it because I missed having a netbook: a small computing platform that can run all day on batteries and is cheap enough that I don’t have to worry about it getting lost or broken. It has a crisp 11.6″ 1366×768 screen with a speedy 1.4GHz Haswell dual-core processor and a battery rated for 8hr operation. It is incredibly thin (0.75″) and light (2.76 lbs) and has the minimal set of important features (USB 2.0, 3.0, WiFi a,b,g, speakers, camera, etc.) 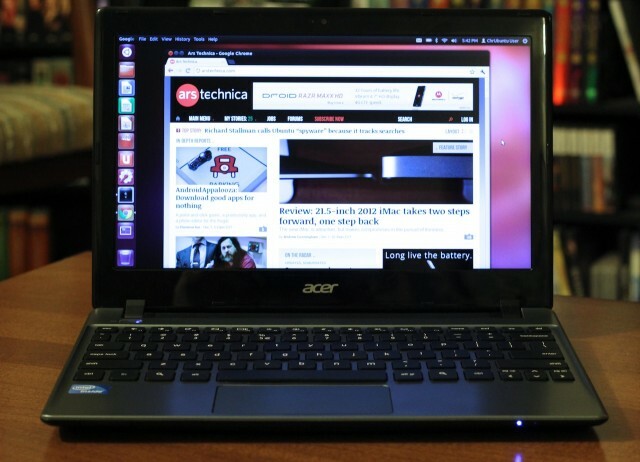 The primary limitations are: 2GB DDR3 RAM, 16GB SSD, and ChromeOS. The keyboard isn’t ideal, but it’s usable. It only took an hour to confirm that I had no interest in ChromeOS; it requires living online within the Googlesphere and if I were a corporate fanboy, I’d be using an Airbook. Fortunately, it’s pretty easy to install Ubuntu (Chrubuntu or Bodhi) as a dual-boot or replacement OS. So far, I’ve partitioned 9GB of the SSD and installed Chrubuntu and it works nicely [see update below; I replaced the OS with Bodhi]. I had to follow these instructions to fix some things in Chrubuntu like resume and a long delay at boot up. Now I’ve got a snappy netbook with ubuntu and most common apps like Firefox, Thunderbird, LibreOffice, gcc. I added Java, NetBeans, and other development tools. The main limitation is RAM and disk space…so far I haven’t been able to do PrimeFaces development on it for lack of RAM. RAM is not upgradable. The SSD is upgradable, but it would defeat the ultra-low-cost goal to spend money on it. Update 8/30/2014: I removed ChromeOS and Chrubuntu and installed Bodhi as the only OS on the C720 and the results are very nice. Bodhi is an interesting distro; it is a very lightweight minimal ubuntu-based system with enlightenment. The disk and RAM footprint is minimal. I then installed only the apps I wanted (firefox, thunderbird, libreoffice, skype, netbeans, gcc, etc.). It is ideal for this space-limited netbook; after all apps were installed, I still had 2/3 of the drive empty and 3/4 of the RAM free. The system is *very* snappy running bodhi. The only issue was lxdm which has problems with ecryptfs (you *must* encrypt at least your home directory on a portable machine right?) so I replaced it with lightdm. I like the Bodhi shelf/gadget system and the iBar gadget which is like Cairo/Apple app dock. I installed ChromeOS on the new SSD (and later on the old 16GB SSD to wipe it): I used the Chromebook Recovery Utility to create a recovery USB flash drive which worked pretty well see here and here for more instructions. You can create recovery flash drives using Windows or Linux. Linux was very smooth; if you use Windows, be aware that you need to delete the partitions on the flash drive before installing the recovery image or the process gets stuck at 0% writing. The Recovery Utility provides a mechanism for deleting old partitions. So I finally have a current Ubuntu with long-term support installed and it works beautifully; it is fast, the trackpad, camera, speakers, microphone, wifi, etc. all work well, and with the larger SSD I have plenty of space.